Oops, she did it again. The LPGA has played two tournaments so far on its 2010 schedule, and Ai Miyazato has won them both. 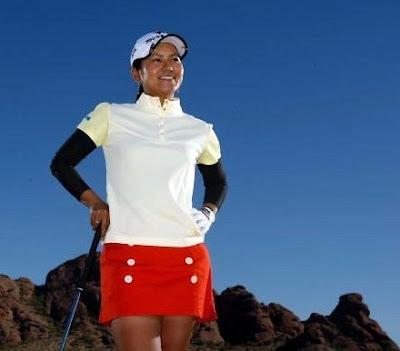 What other golfers in LPGA history have won the first two tournaments on the schedule? Not Annika or Karrie or Se Ri; not Inkster or Sheehan or Bradley or King; not Lopez or Whitworth. Only Babe Zaharias, Mickey Wright, Louise Suggs and Marilynn Smith - four Hall of Fames, two of whom have their supporters in discussions about who is the best female golfer of all time. That's a good list to add your name to. The Constructivist over at Mostly Harmless was liveblogging Ai's win, and expect him to have a great wrapup post, too. As soon as he's finished doing cartwheels, backflips and raising the roof. Do you have Mojo madness? If you've been following the Mojo 6 story, you know that through March 14 you can vote once a day to "elect" the 16th and last player to the field of the April tournament that features LPGA players. A non-official tournament, the Mojo 6 uses a unique competition format in which golfers pick their opponents and face off in 6-hole matches. Anna Rawson wants to be that 16th player in the field, and in an attempt to gain more votes she has made this promise: If she gets in, she'll give any and all of her winnings to charity. See About.com for more, or go vote on the Mojo 6 site. Hee Young Park finished tied for 11th in the LPGA season opener in Thailand. A solid start to the year for one of the tour's up-and-coming players. Park finished 20th on the money list in 2009 after placing 35th in her rookie season of 2008. She had two runner-up finishes last year and is a good bet to get win No. 1 in 2010. Hee Young got a little attention from Golfweek this week: Her photo was used in an article asking the question, "are shorts getting too short on the LPGA Tour?" The photo Golfweek used is slightly different than the one above, but the shorts are the same. Haven't we been down this road before? Several years back Seon Hwa Lee and Jeong Jang were targets of short-shorts complaints from certain prudish quarters. Both got more conservative as a result. Let's hope Hee Young doesn't fall for it, too. After all, you can bet the house that Natalie Gulbis isn't going to stop showing off her legs! We finally get to welcome the 2010 LPGA season this week with the arrival of the Honda PTT LPGA Thailand tournament. And above, Natalie Gulbis, Paula Creamer and Morgan Pressel make their own arrivals, at the tournament pro-am party. This pic was posted on Twitter by Natalie and Paula. If you're looking for LPGA season previews, check out The Contructivist's post that links to lots of them. Move over Kardashians! We've featured the Sadekar sisters many times here on Golf Babes, and will surely feature them many more times given their talents. 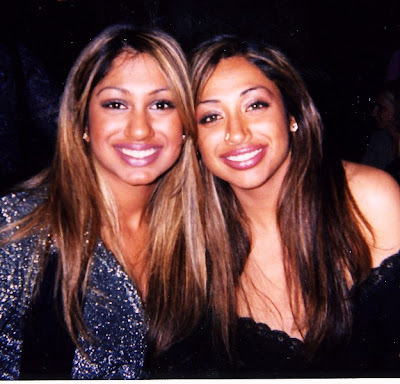 Nisha Sadekar (on the right in the photo above), a former collegiate and professional golfer, is the highly accomplished businesswoman behind the event management company Play Golf Designs. Seema Sadekar is a professional golfer playing on the Duramed Futures Tour and Canadian Tour, pursuing her goal of joining the LPGA. If there's one word that is always associated with Nisha and Seema, it's "style" The Sadaker sisters understand and appreciate style, whether in fasion or accessories or design, whether on-course or off. So it makes perfect sense that Nisha and Seema are branching out into new areas, creating Minx Golf to bring style and golf together. Through Minx Golf, the Sadekars will help existing brands extend that brand into golf, creating sophisticated and elegant products including jewelry, apparel and golf accessories as promotional tools for companies. Minx Golf is partnered with Fusion Commerce, a manufacturing and promotional products company, and one that also happens to be Seema's primary sponsor in 2010. "We are ... being creative and thinking outside the box for 2010," Nisha said. "We are looking forward to a successful year with fresh concepts and ideas to grow women's golf." Minx Golf's "About Us" page further explains the concept: Minx Golf focuses on transcending lifestyle brands to include custom golf lifestyle products. Check 'em out at MinxGolf.com, and also keep an eye out for the sisters' SadekarSisters.com, which will launch in March. Bea Recari was one of the players taking part in the LET's "Player Predictions for 2010" feature. A handful of golfers were asked to predict the winners of big events throughout the year. And Bea was the only golfer who picked herself (good for her!). Below is a clip posted on Bea's Facebook Fan page. Her Web master wrote, "Check this video of Bea training on the Indo Board in mini skirt (to be fair, she didn't know she was going to work out)." Here's an image from the photo shoot Michelle Wie did for the Korean edition of Vogue last year. Michelle will tee off at the same time as the LPGA does in 2010, playing the first tournament in Thailand, followed by the Singapore tournament.